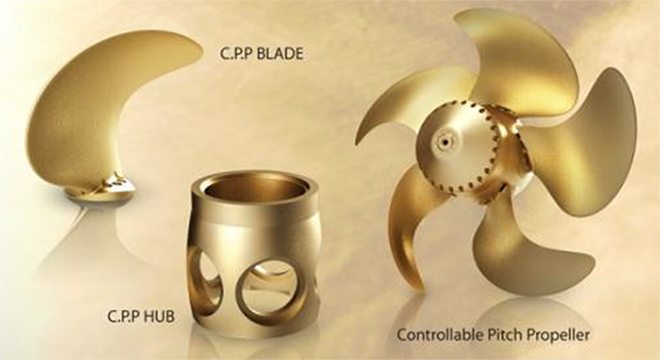 The controlling blade angle of a controllable pitch propeller enables the vessel to move forward or backward and stop more easily. When used with a side thruster, controllable pitch propellers are convenient when vessel speed needs to be changed frequently when entering or leaving port, leaving shore, or docking. In the case of an emergency stop, this type of propeller can immediately respond from full forward to full reverse movement. Since the blade angle can be regulated, vessel speed can be freely adjusted with the engine running at the most efficient load. Use of a controllable pitch propeller can reduce fuel and NOx emissions. Due to these advantages, this type of propeller is used in a wide range of vessels, including fishing vessels, tankers, ferries, and tugboats. Enables efficient operation of the main engine output and minimization of fuel consumption. Efficient operation, high stopping performance, and shorter time spent when leaving the shore or docking due to continuous movement from full forward to full reverse. Reduced fuel consumption by operation at the optimum efficiency point where propulsion efficiency, fuel consumption of the main engine, and other factors are comprehensively considered. Enables the required vessel speed or thrust force to be obtained, even on vessels where load conditions vary greatly such as trawlers and towing vessels. Avoidance of overtorque condition of the main engine by reducing the propeller pitch angle during operation in rough weather compared to regular operation.